There are quite a few quick charging standards in the wild, from USB-PD to Motorola TurboPower. Qualcomm's Quick Charge remains a popular option, used in devices like the Galaxy S8 and LG G6. While there aren't any devices on the market supporting QC 4, Qualcomm has announced QC 4+ with a few additional features over the already-new standard. 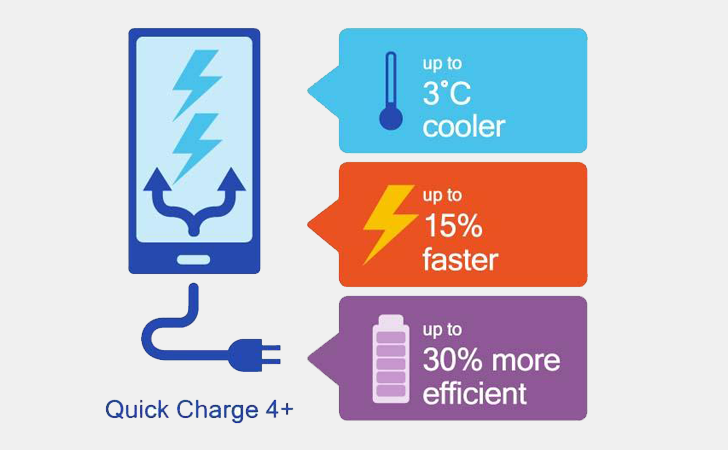 Qualcomm announced Quick Charge 4 in November alongside the Snapdragon 835 processor, and QC 4+ has three major improvements. The first is 'Dual charge,' which divides the charge current across two power management ICs. Qualcomm says this should result in reduced charge time (approximately 15%) and lower thermal dissipation. The second new feature is 'Intelligent Thermal Balancing,' which moves the electric current through the coolest path automatically, eliminating potential hot spots. Finally, QC 4+ includes a handful of new safety features, such as monitoring both the device case and connector temperature levels at the same time. Quick Charge 4+ chargers, USB hubs, and battery banks will have backwards compatibility with QC 3.0 and 2.0. Qualcomm says that the first device with QC 4+ will be the Nubia Z17, which was announced earlier this week.